The Friends of Madrona Woods restored Madrona Creek from an underground pipe to a small stream leading to a new wetland cove along Lake Washington. They also transformed 10+ acres of natural area in Madrona Park from a neglected, dark, scary and weed-infested forest into an open, inviting and healthy native forest with trails, waterfalls and natural creek channels flowing to Lake Washington. Studies have found that juvenile Chinook salmon congregate near small creek mouths along the shoreline, so the project will provide valuable rearing and refuge habitat for young salmon. Map to Site. “Somehow, by taking one season and one task at a time, a few people have transformed a derelict greenspace that invited dumping and nefarious activities into an urban forest that is beautiful, safe and inviting,” said Deirdre McCrary, Friends of Madrona Woods board member. The project was a 100% grass-roots effort. It involved a dedicated and long-term partnership between the Friends of Madrona Woods, a non-profit community organization, and GAYNOR, Inc., landscape architects. The project received grant funds from the city, county and federal government and a community foundation. Permitting was a major challenge. The Friends of Madrona Woods found the JARPA application process to be easy, although they needed professional assistance to prepare the JARPA and other forms required for Corps of Engineers, Washington State Department of Ecology, and Fish & Wildlife (WDFW) permits. They received their permits within a month from both the Corps of Engineers and WDFW. The Ecology permits were pre-authorized with the Corps permits. These state and federal permits do not require a fee. However, obtaining City of Seattle permits was more time-consuming and expensive. Ensuring that the project met city codes and requirements was a challenge that took more than a year. Restored and enhanced 7-8 acres of native forest and riparian habitats, including the entire 3-acre watershed of Madrona Park Creek. 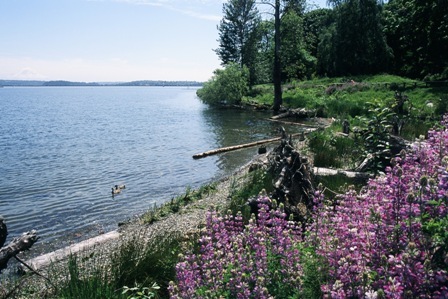 Created 2/3 acre of new native habitat and wetland cove adjacent to Lake Washington. 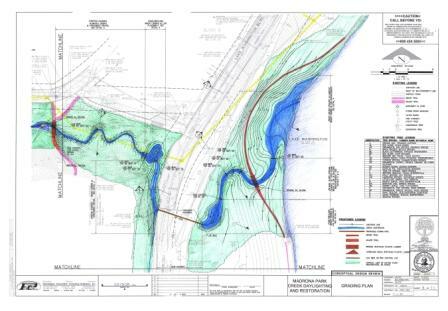 This included 400+ lineal feet of natural shoreline and 600 lineal feet of fish-passable channel, providing rearing and refuge habitat for threatened juvenile Chinook and other salmon species. Built a 0.4 mile trail system that is sustainable, scenic and safe. Daylighted over 1/4 mile of Madrona Park Creek from its headwaters to Lake Washington. Built 4 waterfalls and about 30 step-down weirs, offering visible and audible water experiences. Installed about 75 pieces of large woody debris and 200 granite boulders to stabilize creek channels and lakeshore, and provide habitat and visual interest. Conducted 7 years of hands-on environmental education in the Woods with students from local K-12 schools. Provided 2 series of “Walks in the Woods” educational tours for the general public. Involved more than 500 volunteers in restoration activities. More than 500 volunteers helped restore Madrona Creek. The project provides “rearing and refuge” habitat for fingerling salmon migrating along Lake Washington to Puget Sound. The cove, ponds and connecting stream provide one of few such places along a shore dominated by lawns, retaining walls and rip rap. The restored creek and new natural area are more appealing and accessible to residents. It is an outdoor classroom for local school children, families and nature-lovers of all kinds. 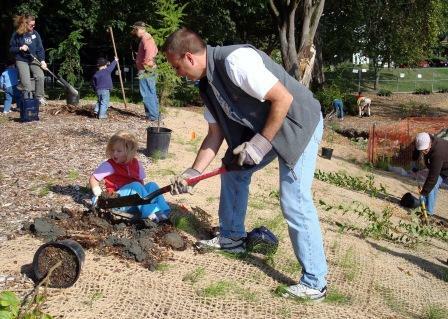 The visibility and uniqueness of the new natural area in Madrona Park attracted new volunteers to help with planting, monitoring and maintenance. The Friends of Madrona Woods offered several suggestions for community groups wanting to do restoration projects. In applying for grants, plan 1 – 2 years ahead so that you have the funds when you need them. Even if busy with other tasks, don’t let good grant funding opportunities pass you by. Get professional assistance with experience in design, in the field, in city hall and in grant writing. Make sure you have a committed core group of people who get along and are passionate about making a difference. Educate yourselves and develop a good plan. Be willing to work with others and to compromise; be grateful for help wherever you find it. Be flexible; even with the best of plans, things will take longer and turn out differently than you expected. Be determined, patient and persistent. It will take years and lots of hard work. Think big and believe you can make something happen. “I’m amazed at what this small band has brought into being. I get immeasurable pleasure from walking down and seeing how beautiful it is, listening to the stream, seeing the plants and ducks on the pond,” said Judith Starbuck, Friends of Madrona Woods board member. Find photos, examples and details about green shorelines here. Thank you for any other informative site. The place else may just I am getting that kind of information written in such an ideal means? Thanks for the very interesting and informative article on Madrona Woods. I just learned about this website in an email from nonprofit Save Lake Sammamish, of which I am a member.